Asking for money is not our specialty. We’re better at putting together an award-winning, quarterly, print magazine with keen board members and dedicated part-time staff. But, as you know, subscriptions alone do not keep this venture going. So, we have to ask you, as we do only twice a year, please, if you can, make an extra contribution to support the work of Geez magazine. I realize that you may already be one of our “Geez Monthly Donors.”* If that’s the case, please read this letter as a word of thanks for your ongoing support and only a gentle nudge to give more if you can. While you’re thinking about making an extra contribution, let us fill you in on some recent highlights from behind the scenes. We are over-the-moon excited about the soon-to-ship Winter issue on the topic of prisons. We had great guest editors: singer-songwriter John K. Samson and contributing editor Miriam Meinders. We explore the implications of prison abolition for a society addicted to incarceration. Any former Bible-thumper will recall Jesus saying he has come to “set the captives free.” We take that sentiment, coming from the underside of empire, seriously. After long-time subscription manager and associate editor Tim Runtz finished his term we hired Bethany Daman, a recent communications grad to cover circulation. We have a new business plan, thanks to a contract with Charmagne Reimer de Veer. Early next year, a consultant from Toronto, Sharon McCauley, will further assist us in business development (thanks to Magazines Canada). After three years at the magazine, assistant editor Kyla Neufeld departs in February to start her new role as editor of an online Anglican magazine, the Rupert’s Land News. This activity is only possible with your support, dear reader. 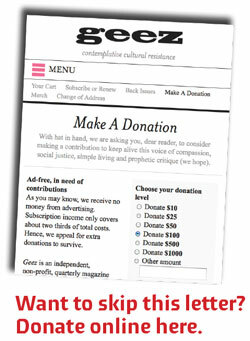 If you want to give a gift to a loved one, please see the gift subscription options online.